Maintain your metal with Brasso Metal Polish Wadding. For use on brass, copper, stainless steel and chrome. Longer lasting shine. Easy to use. 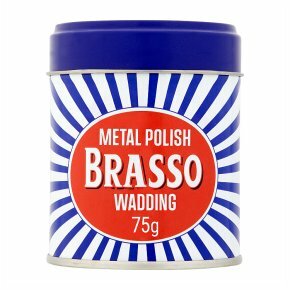 Gives you excellent results that have stood the test of time.Brasso Metal Polish Wadding keeps metal looking immaculate. For use on brass, copper, stainless steel and chrome, this product has been specially designed to provide excellent results and a longer lasting shine. These wadding pads have been impregnated with cleaning fluid meaning there is no need to get an extra cloth dirty. Brasso Metal Polish Wadding has been in use for over a century - it has truly stood the test of time - and this product will continue to maintain the lustre of metal surfaces in the future. To use Brasso Metal Polish Wadding remove the wadding and apply evenly to the desired metal surface in small circular motions. Once evenly applied leave for a few minutes before buffing with a dry cloth. Directions: Remove wadding and polish evenly for best results.